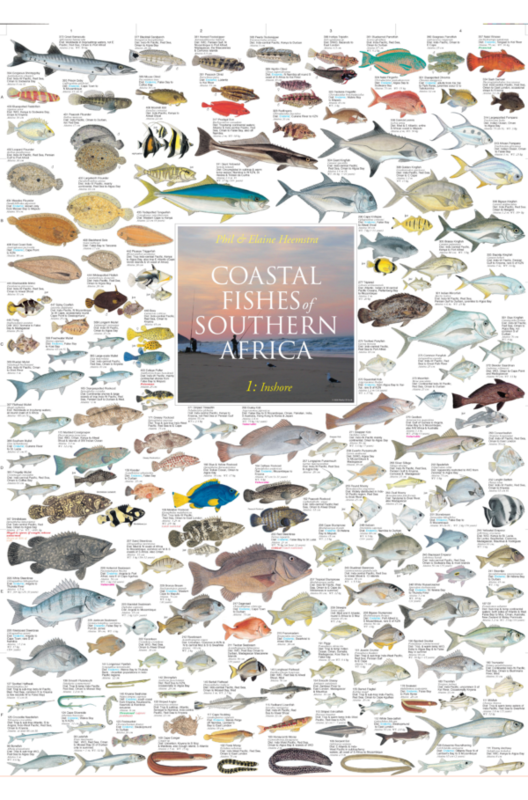 The 138 brilliant illustrations by Elaine Heemstra on this poster depict the wonderful shapes, colours and varieties of marine fishes found off the southern African coastline in estuaries and intertidal and sub-tidal zones or close inshore. Approximately 16% of southern Africa’s coastal fish are endemic species – found only in this region. There is often a great deal of colour variation between individuals within a species, as well as change in colour and body shape from juveniles to adults. Pattern and colour differences also occur between males and females of the same species. The names of all the fishes illustrated on this poster are shown in English with their scientific name in Latin. Distribution areas are given together with the maximum size and weight attained in a species. Endemic species are indicated in blue. The status of fish species whose numbers are threatened or vulnerable or where their catch is prohibited or restricted are shown. Where there is a great difference in colouration between males and females of a particular species, both are illustrated. Juveniles of many species are also shown. Among the fish families illustrated on this poster are: catfish, clinid, emperor, fingerfin, flathead, flounder, grunter, kingfish, kob, moony, moray, mullet, parrotfish pompano, ponyfish, pursemouth, rockcod, rockskipper, seabream, sole, steenbras & stumpnose. This poster will adorn any wall at home, in the waiting room, at the office or in school or university. It will make a perfect gifts not just for people interested in marine fishes but for nature lovers in general.